Here we present some results from the Laboratory of Fundamental Research, at the Research Institute of Eye Diseases, Moscow. Corynebacterium diphtheriae bv. Mitis. 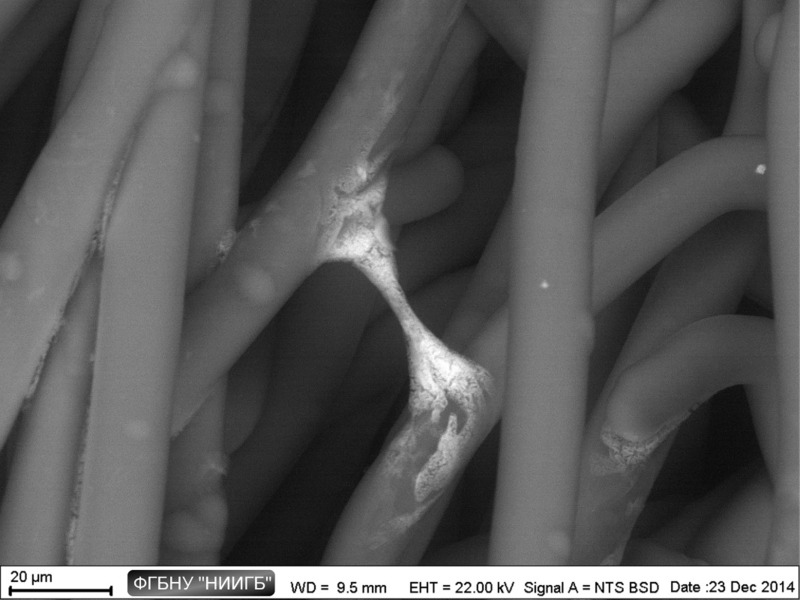 In the picture one can see filamentous structures, to which corynebacteria adhere (cord factor). The photomicrograph was taken through Zeiss EVO LS10 scanning electron microscope with BSE detector. Prior staining with BioREE-B kit. Impression cytology specimen. A mucosal imprint of the tongue on adhesive coated plasticware. Sample preparation with lanthanoid staining. Scanning electron microscopy, back-scattered electron detection mode. Desquamation of the epithelium; large epithelial cells are surrounded by bacterial colonies. Klebsiella pneumoniae cells on laboratory plastic. Brightness variations are due to differences in lanthanoid uptake during supravital staining. SEM-BSE. Staphylococcus aureus. 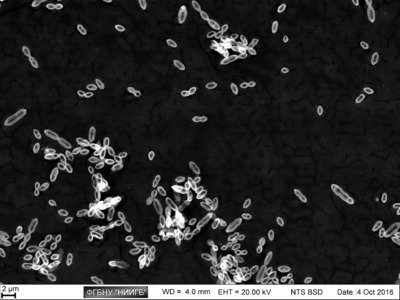 An experimental bacterial colony on the surface of a silicone drainage. Scanning electron microscopy (Zeiss EVO LS10, BSE, low vacuum mode). Besides ‘semitransparent’ cells, one also sees the surrounding portion of ground substance, which is usually unstable. Streptococcus pneumoniae cells on laboratory plastic. A micrograph taken throug Zeiss EVO LS10 scanning electron microscope with BSE detector. Prior staining with BioREE-B. 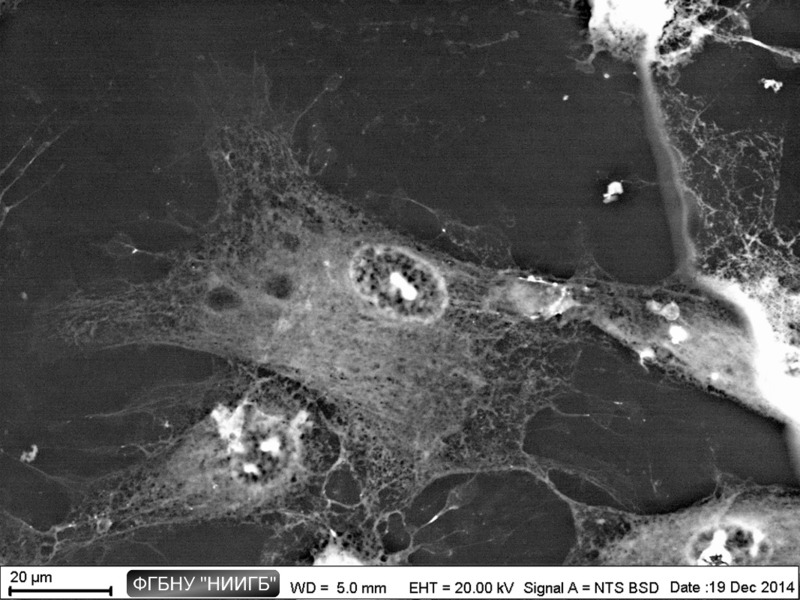 Human astrocytes imaged through the Zeiss EVO LS10 scanning electron microscope equipped with a BSE detector. Sample preparation using the BioREE staining kit. The cells are adhered directly to culture plastic. One can see a bright nucleus, thin cytoplasmic outgrowths connecting the cells with each other, and rounded mitochondria deeply embedded in the cytoplasm and partially overlaid by cisternae of the ER. 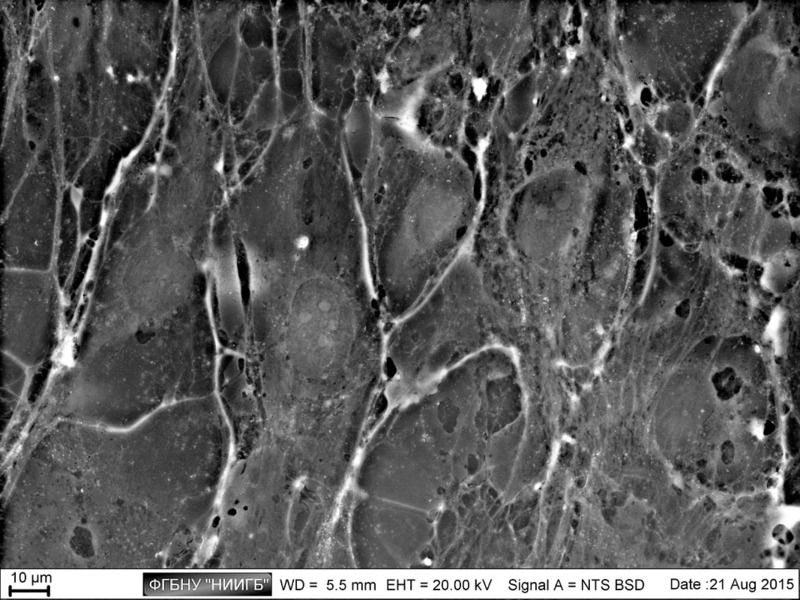 A group of human astrocytes on culture plastic. Lanthanoid staining. The photomicrograph was taken through a scanning electron microscope in back-scattered electron mode. 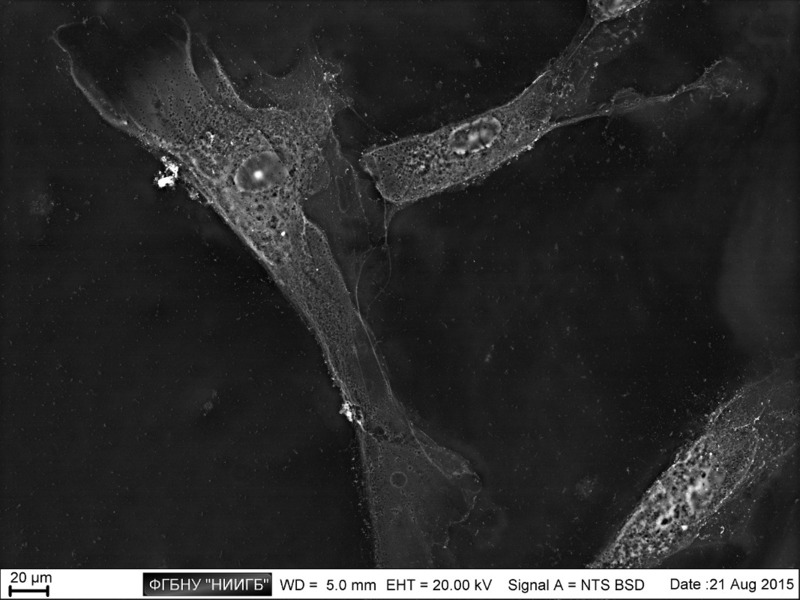 Within the large cell in the centre one can see a bright nucleus with numerous nucleoli surrounded by the ER, well-arranged cytoskeleton parts, and rounded mitochondria in the periphery. Human corneal epithelium from a patient with recurrent erosion. 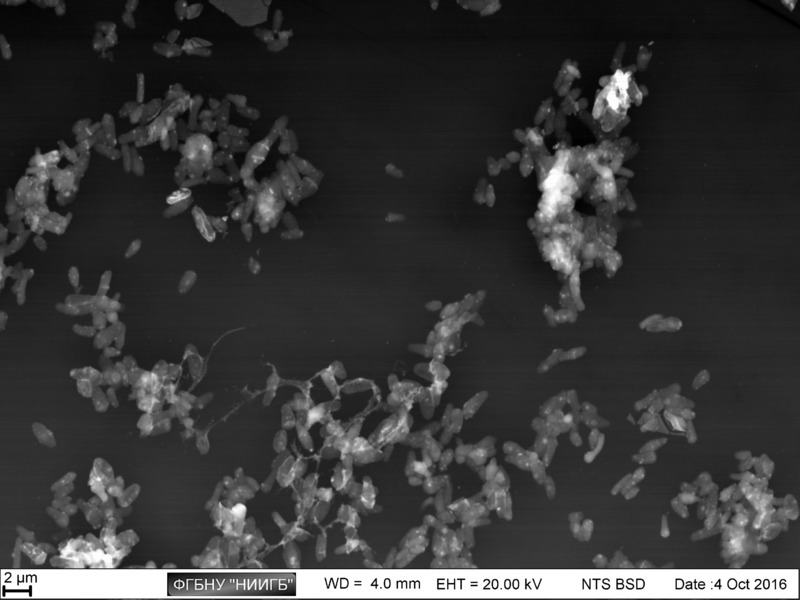 The micrograph was taken with the Zeiss EVO LS10 SEM in BSD (back-scattered electron detection) mode after the sample had been stained with NdCl solution. Cell borders and nuclei are brightly contoured. Architectonics of the superficial cell layer is clearly distorted. Scraped corneal epithelium from a patient with recurrent erosion. Lanthanoid staining. Scanning electron microscopy, back-scattered electron imaging mode. There is an evident difference in the uptake between the superficial and underlying layers. Cell borders are generally disturbed and brighter in the area of desquamation. 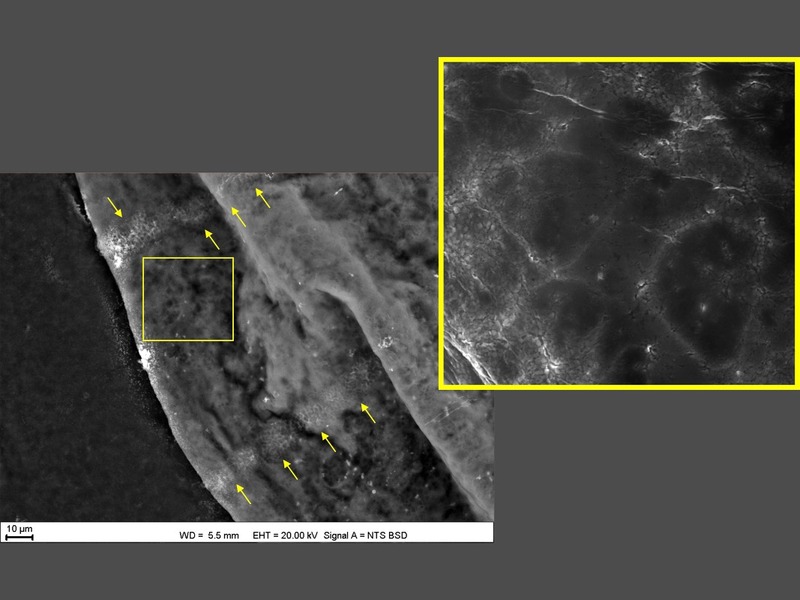 SEM-image of human corneal limbal epithelial cells on culture plastic taken in BSD (back-scattered electrons detection) mode after the sample had been stained using the BioREE kit. Cell borders and tiny cytoplasmic outgrowths are clearly visible. The cytoplasm contains numerous vacuoles. The nucleus and nucleoli can also be seen. A group of corneal limbal epithelial cells on culture plastic. The photomicrograph was taken through the Zeiss EVO LS10 scanning electron microscope with a BSE detector. Beforehand, the sample was stained with lanthanoid solution. At the voltage of 20 kV cell borders and cytoplasmic inclusions are visible. The cells are notable for untypical outgrowths with 'cupules'. 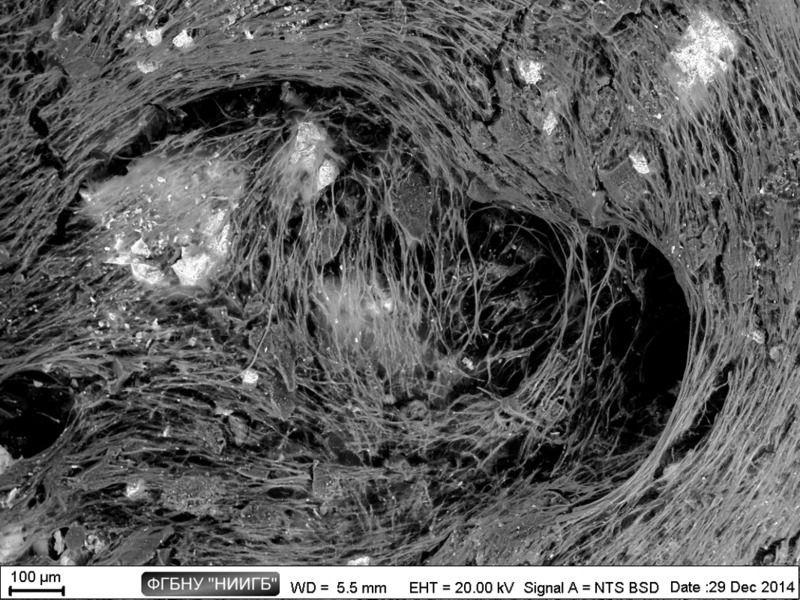 Human corneal limbal epithelial cells on culture plastic (SEM-image, BSD mode). The scanning electron image was taken after the sample had been exposed to a rare earth metal salt (neodymium chloride) solution. Cell borders and thin cytoplasmic outgrowths are visible. Extended structures here and there correspond to the cytoskeleton. The nucleus looks fuzzy - perhaps, the voltage was not high enough. Monolayer culture of human corneal limbal epithelial cells. This is a BSE-image taken through the Zeiss EVO LS10 scanning electron microscope after the sample had been stained with neodymium chloride solution. One can see thin structures twining around the cells, nuclei, nucleoli, and rounded mitochondria embedded in the cytoplasm. Monolayer culture of human corneal limbal epithelial cells (SEM-image, BSD mode, BioREE staining). Intercellular spaces with 'hollows' are bright. The inner structures include nuclei, nucleoli, rounded mitochondria, and endoplasmic reticulum. 4T1 tumor cells. The photomicrograph contains rounded cells, nuclei with numerous nucleoli, and cytoplasmic outgrowths that form intercellular contacts. Neodymium chloride was used as the contrast agent. A giant multinuclear cell from metastatic 4T1 mouse carcinoma cell line. One can see filopodia and intercellular contacts. The image was taken through the Zeiss EVO LS10 scanning electron microscope. Dental pulp stem cells from deciduous teeth on culture plastic. One can see cytoskeleton parts, nucleus with nucleoli, and some yet unidentified compound synthesized by the cell (bottom of the image). This compound has been found impossible to be visualized using common methods of sample preparation: it either demonstrates low contrast if observed under fully hydrated conditions, or dissolves completely if the sample is fixed. 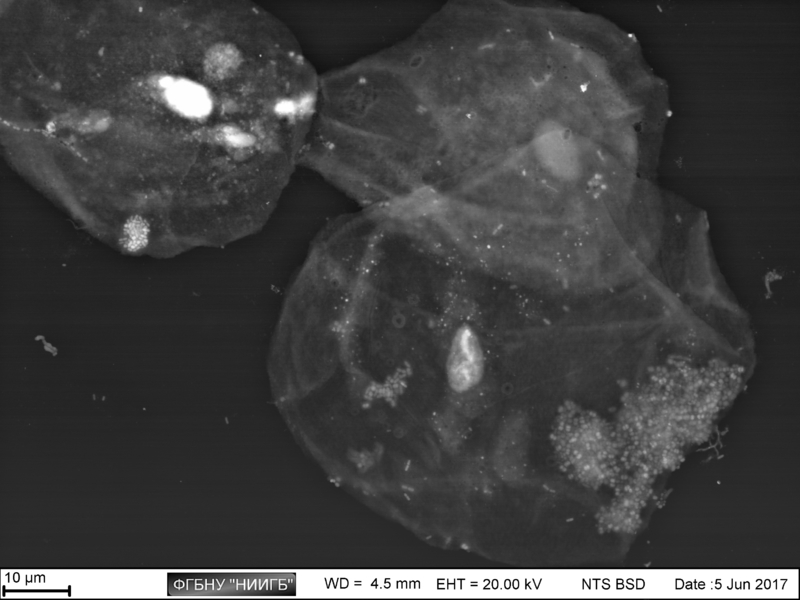 This image was taken using back-scattered electron detection. 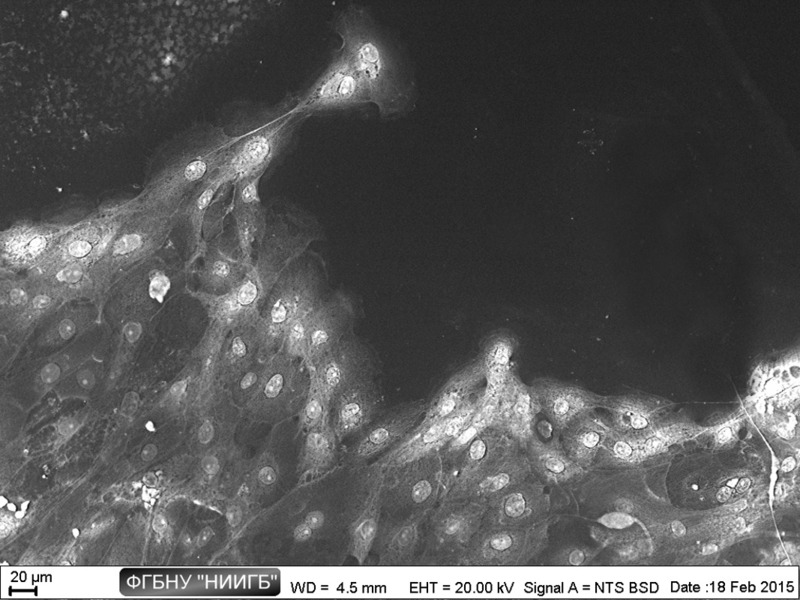 Dental pulp MSCs (SEM-image, BSD mode). The cell in the centre is spread across the culture plastic plate and produces thin bands to bind to the substrate with. The most of the internal volume of the cell is occupied by endoplasmic reticulum. Rounded ‘hollows’ are likely to indicate the location of lysosomes. 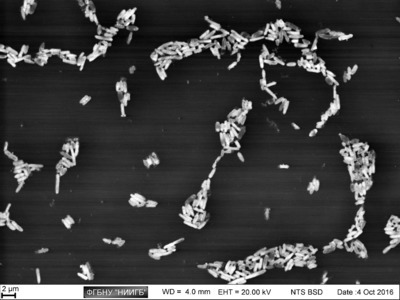 Clearly demarcated structures at cell surface may be exosomes in the process of opening. One can also see intercellular contacts with a smaller cell to the right. Dental pulp MSCs loaded with magnetic particles. Silicate glass. The micrograph contains all the main structural elements of the cells, particularly, nucleus, nucleoli, endoplasmic reticulum, cytoplasmic outgrowths, and mitochondria. With back-scattered electron detection, the cells are well visible even though the contrast of the image is generally low. Scanning electron micrograph (Zeiss EVO LS10) of dental pulp MSCs on culture plastic. As seen in the image, the cells are partially embedded in a substance of low electron density. Within the cells one clearly sees nuclei with nucleoli, cisternae of the ER that occupy the most of the internal volume, and bright, though unevenly stained, mitochondria. Scanning electron micrograph of cells from the inner surface of an onion flake (Allium cepa). Beneath the folded membrane there are nuclei and small organelles. The image was taken in back-scattered electron detection mode. Sample preparation involved staining with neodymium chloride. 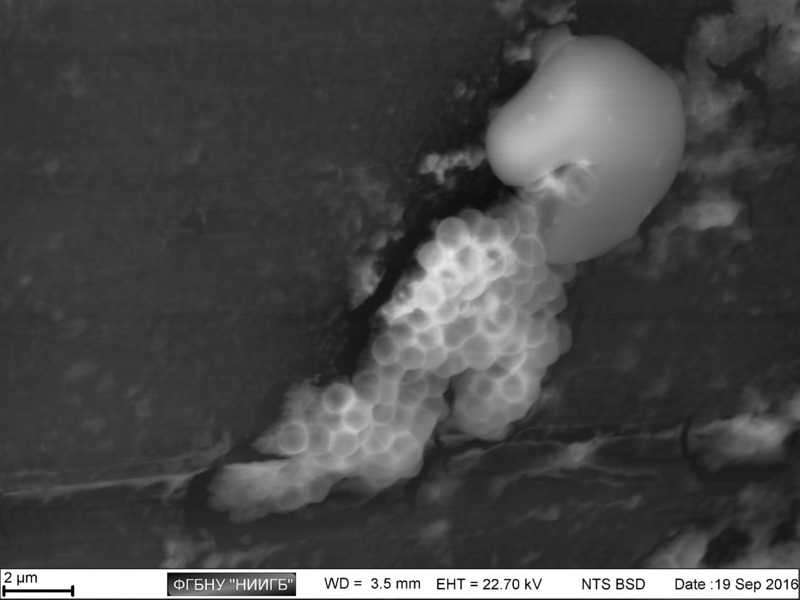 Dental pulp MSCs from deciduous teeth on Alvetex porous scaffold. The micrograph shows spatial relationships on the ribs of the pores. One can see how the cells lengthen out to span two ribs. Nuclei are overlaid by the ER, but can still be easily discerned. Cytoskeleton parts and cytoplasmic outgrowths are used to bind to the substrate. Bright spots deep in the cytoplasm are mitochondria. Neodymium chloride was used as the contrast agent. "GLAUKON" LLC, TIN: 7722708109, PSRN: 1107746061114, Address: 11A-2, room 6/9, Entuziastov shosse, Moscow, Russia 111124. By permission of FSBSI ‘Research Institute of Eye Diseases’ and according to the patent application RU 2578977 C1. The information provided in this website is provided for information purposes only and does not constitute a public offer. "GLAUKON" LLC, 22.09.2015.